Les ressources en imagerie médicale sont parfois essentielles pour renforcer le réalisme de vos scénarios. Le site RADIOPAEDIA propose une grande collection d’images facilement utilisables (un simple copier/coller suffit). Le plus souvent les images sont proposées dans le cadre de cas cliniques qui pourront tout à fait donner lieu à la création de scénarios originaux. Les images sont toutes libres de droit. The International Pediatric Simulation Society (IPSS) and the Scientific Committee of the 7th International Pediatric Simulation Symposia and Workshops, IPSSW2015, invites the submission of original scholarly work in the field of pediatric and perinatal simulation education, research, administration, technology, innovation and evaluation. Submissions that align with the theme of the conference (IPSSW2015 – Reaching Out to the Future) are particularly welcome. Completed projects, work in progress, abstracts previously presented at regional, national or international meetings will be considered. Simulation research using standardized patients/actors and virtual reality as well as mannequin simulators, task trainers and computer-based simulations are encouraged. In some instances, abstracts submitted as oral presentations or round table/panel discussions, and deemed to be of scientific merit, may be assigned as poster presentations due to limited availability of time for oral presentations. As in other years, awards will be given for abstracts of exceptional quality. Download the Abstract Submission Guidelines and submit your proposal using the Abstract Submission Platform no later than Friday 26 September, 2014, at 11:59 PM (GMT). Please keep this date in mind in order for your submission to be considered. For more information about IPSSW2015 please visit the event’s website or contact info@ipedsim.com. 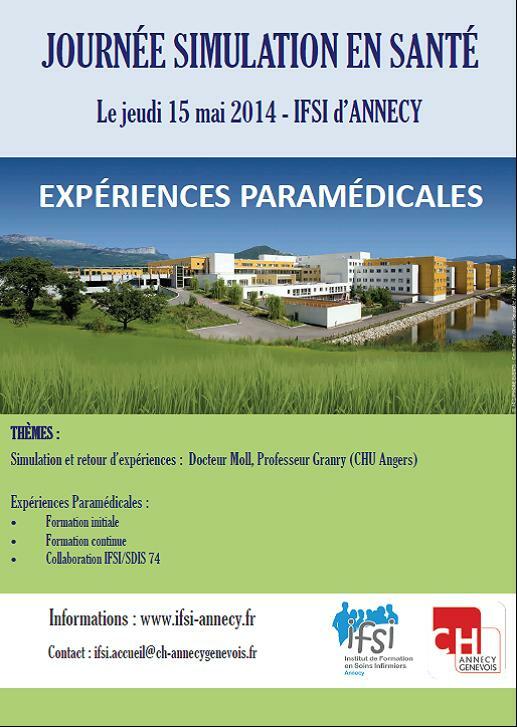 L’Institut de Formation en Soins Infirmiers d’Annecy organise le 15 mai 2014 une journée Simulation en santé sur le thème des « expériences paramédicales ».